NamePlace’s new marketplace for municipal naming rights and sponsorships, above. The variety of sponsorship types, primarily offline, is something we help cities, initially and parks and rec departments realize. Some of the obvious long tail opportunities are baseball diamonds, soccer fields and swim centers, these type of community opportunities attract families in a very positive social environment. Many businesses want to be involved in corporate social responsibility programs but don’t know how to proceed. So we also selectively bundle sponsorship opportunities into larger campaigns, driven by timing, region or other relationships, creating attractive and easy ways for advertisers to buy. You’ll be hearing more about NamePlace in the upcoming weeks and months. Our beta is live and we are bringing cities online as we speak. If your city or organization would like to get involved, please visit NamePlace.com and leave your contact information or contact me directly lisa at nameplace dot com. 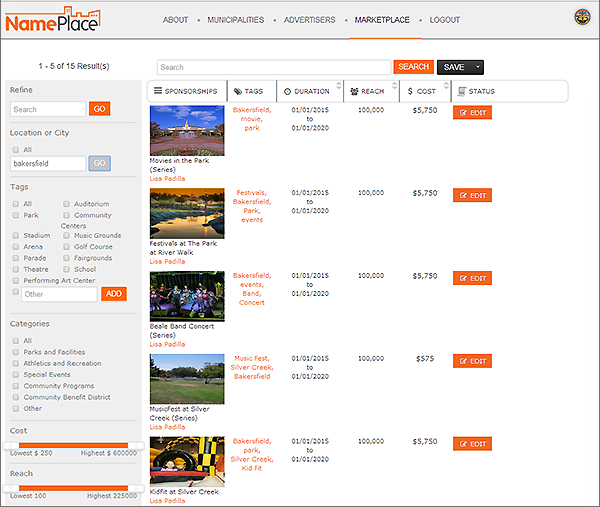 Advertisers can also contact us at sales at nameplace dot com. This entry was posted in technology and tagged marketplace, sponsorships. Bookmark the permalink.